Oct 16, 2018 SNS Focus XT: The Go-To Energy Nootropic Supplement Base.. Now in Candy Corn! Focus XT can be used by individuals for a variety of purposes. Examples of this include: individuals trying to improve their workout and athletic performance; students wanting to enhance their focus, concentration, and productivity while at school or studying; individuals whose jobs require optimal mental performance; people who lose focus easily and/or are easily distracted; people that work long shifts and need to stay focused and alert (examples: fire fighters, EMT's, nurses, and others); Gamers/eSports enthusiasts looking to improve their focus, concentration, reaction time, and alertness; and by others who feel that they may benefit from the variety of benefits that Focus XT is used for. Each ingredient is used at a specific dosage for a specific reason. This is not a 'Little bit of everything, not enough of anything' type product. Although Focus XT contains a wide variety of benefits and uses, it was formulated with one goal in mind – to deliver real results. 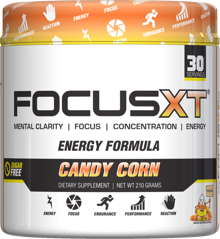 Focus XT users generally do not report any of the nervousness, jitters, or 'crash' feelings that are commonly associated with many other energy products on the market. The energy from Focus XT is normally described as a very 'Clean & Smooth' feeling. You feel tired and unmotivated, your thought process is not clear. Any activity that requires concentration and focus is the last thing you want to do whether it is a workout, your job, class, or a big test. You know the feeling. It can be a vicious cycle. It's not an answer, it's not a cure all, but help has arrived, and help has a name, Focus XT.